FirstDawn Arts is proud to inform the general public that its movie Seasons of a life has been selected to participate at the 21st edition of the Pan African Film and Television Festival of Ouagadougou (Festival panafricain du cinéma et de la télévision de Ouagadougou or FESPACO), which will take place in Ouagadougou, the capital of the West African country of Burkina Faso from 28 February to 7 March, 2009. FESPACO, as it is commonly called, is the largest African film festival, held biannually in Ouagadougou, Burkina Faso. The festival is the biggest regular cultural event on the African continent and it mostly focuses on the African film and African filmmakers. It is hugely successful. The festival is for African film industry professionals offering them the chance to establish working relationships, exchange ideas and to promote their work. FESPACO's stated aim is to "contribute to the expansion and development of African cinema as means of expression, education and awareness-raising". Since FESPACO's founding, the festival has attracted visitors from across the continent and beyond. FESPACO features movies with political and socially relevant themes and presents awards that symbolise African cultural identity that lives on through the creation of African filmmakers who use their talents to effectively tell our story. Seasons of a life has been short-listed for the official competition in the Video/TV Film category. Shemu Joyah and all those at FirstDawn Arts are overjoyed that their first-ever film has not only been invited to this prestigious festival but also has been selected for official competition. FirstDawn Arts is proud to inform the general public that its movie Seasons of a life was selected and participated at the Third Kenyan International Film Festival, which took place in Nairobi, Kenya, from the 22nd of October to the 1st of November 2008. Seasons of a life was screened at three different venues, namely, the Alliance Francaise Auditorium, National Theatre, and the Goethe-Institute Auditorium. Over 200 films participated in this year`s festival, and Seasons of a life was shortlisted in the best film category. The director, Mr. Shemu Joyah, attended the festival and was overwhelmed by the response the movie got from both the audience and fellow film directors at the festival. One of the interesting moments was when the movie was screened at the National Theatre to approximately 400 film students from several universities and colleges. Afterwards, the director was engaged in a Question and Answer session with the students. Initially scheduled for thirty minutes, the session lasted for almost 2 hours due to the popularity of the movie. Shemu Joyah also had the privilege of attending the Eastern African Film Maker’s Forum, which took place at the Nairobi Safari Club. Here, the members discussed some of the challenges faced by filmmakers in the region and how these can be overcome. At the end of the workshop an Eastern African Filmmakers Union was formed and he was incorporated as a member. Seasons of a life has also been selected to participate at the 32nd Cairo International Film Festival in Egypt, which will take place from the 18th to the 28th of November 2008. Seasons of a life is one of the fourteen films that have been shortlisted in the International Competition for Feature Digital Films. Besides Malawi, other countries represented in this category are the United States of America, Italy, Spain, Argentina, Egypt, Turkey, Croatia, Ireland, Japan, Lebanon, South Africa, Nigeria and Pakistan. 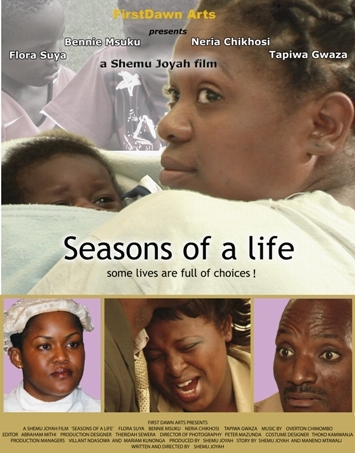 Earlier on Seasons of a life had been shortlisted in the main international film competition but was changed to the digital category because the film was not on 35mm print. The film will be premiered at the Good News Cinema on Wednesday 25th November at 7:00pm. Shemu Joyah has been scheduled to hold a press conference after the screening of the film. Cairo International Film Festival is listed as a category one festival by FIAPF (International Federation of Film Producers Associations). There are only 12 festivals listed in category one in the whole world, and Cairo is the only one in Africa on the list. Therefore Shemu Joyah and all those at FirstDawn Arts were greatly surprised that the first film they have ever produced has got recognition at such a highly ranked film festival. Regardless of the outcome of the competition, the fact that Seasons of a life from Malawi was ever thought worthy to be listed amongst films from some of the greatest filmmaking countries in the world is something to be proud of. FirstDawn Arts is proud to inform the general public that its movie Seasons of a life has won two awards at the 12th Zanzibar International Film Festival (ZIFF) in Zanzibar, Tanzania. 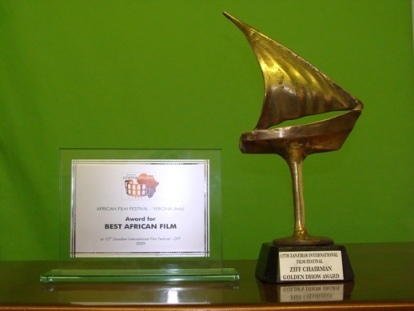 The first award, The Verona Jury Award for the Best African Film, is given to a film deemed by the Verona Jury as the best African feature film in competition. This means that the film shall be shown at the African Film Festival of Verona, Italy. It will also be shown at two other Italian film festivals. The other award, The ZIFF Chairman Golden Dhow Award, is given by the ZIFF Chairman to the film that has the widest audience appeal. The festival took place from 27th June to 4th July 2009. ZIFF is a unique initiative for the sustained preservation and development of the region's rich cultural heritage and the work of contemporary artists. ZIFF's main activity is the organisation of the annual Festival of the Dhow Countries that takes place around the first two weeks of July and its mission is to promote internationally and to develop film and other relevant cultural industries as tools for social and economic growth in the region, as exemplified in Zanzibar. Shemu Joyah and all those at FirstDawn Arts are overjoyed by this achievement. For a full list of winners, click on the image below.